Oct. 4 — When horrific amusement park accidents occur, the nation’s round-the-clock news programs light up with grim images of mangled metal, terrified parents and screaming children. But the accident—be it a New Jersey roller coaster crash or a fatality at a Missouri waterpark—soon drops from the spotlight and many of us trust that government investigators will work diligently to prevent future tragedies. Here’s the stark truth: The cavalry isn’t coming. And whether one is even needed depends on who you ask. The few statistics we have suggest amusement park rides are generally safe, including those run by industry giants Walt Disney, Six Flags, and Universal Parks. Each year, 335 million patrons take about 1.6 billion rides at the nation’s 400 U.S. amusement parks. And the chance of being “seriously injured” on a fixed-site amusement ride at a U.S. amusement park is only about 1 in 16 million. But the source for much of that scant data is the International Association of Amusement Parks and Attractions (the IAAPA)—a booster for the amusement park industry. And an authority on amusement park accidents questions the industry’s numbers and its overall rosy outlook on rider safety. He also says it’s hard to find “reliable” data about safety. Professor Christopher J. Robinette—who recently published a blog on amusement park ride safety and liability—teaches at Widener University’s Commonwealth Law School in Harrisburg, Pa., a short drive from Hershey Park. No single source for data exists because regulation of amusement parks and carnival rides is split between the federal government and state and local governments, he said. The data gap is matched by a lack of comprehensive, uniform regulation at the federal and state levels, another authority on recreational safety and liability told Bloomberg BNA. Most consumers assume thrill rides at theme parks and carnivals must conform to some type of legal safety standards which would include inspection and maintenance requirements, said Professor James Kozlowski, of George Mason University’s School of Recreation, Health and Tourism in Manassas, Va. But this is “clearly not the case,” he said. In most jurisdictions, personal vehicles are subject to mandatory safety standards, but not amusement rides, Kozlowksi said. That being said, in “most instances, the industry effectively polices itself with little or no governmental involvement,” he said. Robinette is not so sure. It’s “difficult to determine whether safety is increasing or decreasing,” Robinette told Bloomberg BNA. He is particularly concerned about injuries to children, far and away the largest category of riders. Likewise gauging the litigation trend can be tricky. Some attorneys see a recent increase in litigation over amusement park accidents. But others disagree. ‘‘I don’t see an uptick in the frequency of failures, or the frequency of cases,” plaintiffs’ attorney Daniel G. Kagan told Bloomberg BNA. Most of those interviewed by Bloomberg BNA do seem to concur though that attention on rider safety goes up and down with the seasons. In particular, the summer, when amusement park attendance and, as a result, related accidents peak. It also is swayed by on-again, off-again news coverage of the topic. ‘‘What has changed is the level of scrutiny such safety failures are meeting in the public,” said Kagan, with Berman & Simmons in Lewiston, Me. “I see an increase in public awareness, which is wonderful for public safety,’’ he said. Some, however, can’t even come to agreement on that. This four-part series examines all of these issues—the regulation, the media coverage and the litigation. And It begins with the data. The industry trade group’s data was provided by Cameron Jacobs, IAAPA’s media relations manager. The data focuses on “serious” injuries on amusement park rides that required an overnight hospital stay. It pegs the number of such injuries at 111 for 2014, on par with 2012 and 2013, and less than the sum from a decade earlier. Robinette cited a 2013 study by Nationwide Children’s Hospital in Columbus, Ohio, that concluded about 4,400 children visit emergency rooms each year for harm caused by a variety of rides, including those at shopping malls. 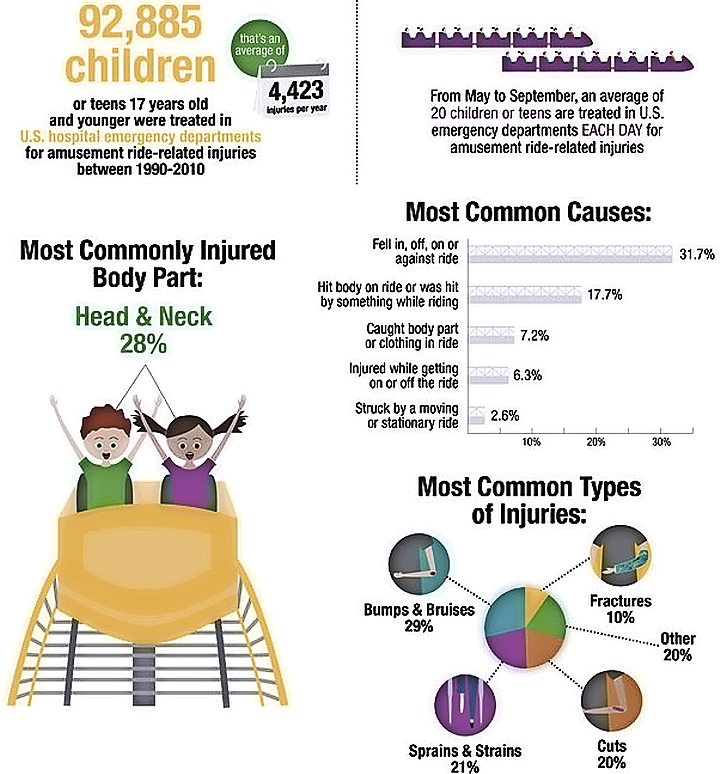 The Nationwide Children’s Hospital study looked at injuries both minor and significant. Plaintiffs’ attorney Robert A. Clifford, the founder and senior partner at Clifford Law Offices in Chicago, has long followed amusement park safety and litigation. In addition to the Nationwide Children’s study, he cited limited data from the Consumer Product Safety Commission, which monitors accidents but has been barred by Congress from regulating much of the industry. The CPSC has reported 29 deaths on amusement rides or water slides since 2010, Clifford told Bloomberg BNA. “The sad part is that the public generally becomes aware and more concerned after a tragic incident occurs. What is necessary is constant diligence,” Clifford said. • Boy killed in August while riding on a waterslide at the Schlitterbahn Waterpark in Kansas City. • Three children injured in August after falling out of a of a Ferris wheel at a county fair in Greeneville, Tenn.
• Boy falls from roller coaster in August at SoakZone amusement park in Ligonier, Pa.
• Girl injured on a carnival ride in May in Omaha, Neb. • Six injured on amusement park ride in August at Ocean Beach Park in New London, Conn. Undoubtedly, the intense publicity and imagery that follows frightful accidents alter our perception of safety. The media focuses on gory accidents, but interest tends to wane after lawsuits get bogged down in the often slow moving judicial process. By the time suits are settled, often confidentially, most reporters have moved on to more absorbing news. Robinette, too, acknowledges the problems with the ups and downs of media coverage. “Similar to shark bites, incidents of amusement park injuries are vivid and attract media coverage,” he said. The “24/7 nature of the popular media” plays an outsize role in shaping public perception about safety and liability, Kozlowski said. Risk isn’t the only factor that can be exagerated at times. The notion that someone will be held accountable in a court of law when an accident occurs also is distorted. The public assumes lax safety gets punished. But based on a review of reported court decisions, “liability is the exception, rather than the rule,” he said. And there is an “erroneous tendency to equate a catastrophic injury or death with liability,” he said. In fact, just as accidents appear to be relatively rare, at least according to the limited data available, litigation too doesn’t appear to be on a dramatic upswing. Defense attorney Michael J. LeVangie, with the LeVangie Law Group in Sacramento, Calif., told Bloomberg BNA his clients are seeing a “slight uptick” in the number of lawsuits over rider accidents. But the “slight uptick” may just reflect the “increasingly litigious society” we live in, said LeVangie, who thinks park rides today are extremely safe and are significantly safer than in decades past. Defense attorney Jordan Lipp, a partner at Davis, Graham & Stubbs in Denver, told Bloomberg BNA he is not aware of any reliable publicly available metrics on theme park litigation. “My gut sense is that there has not been an uptick in lawsuits,” he said. The recent media attention from a series of summer accidents might lead to more lawsuits, but “it is just too early to tell,” said Lipp, who devotes a substantial part of his practice is defending ski areas, amusement parks, and other companies in the outdoor recreation industry. Looking ahead, Michael Talve, managing director of The Expert Institute in New York, which helps litigators find expert witnesses, told Bloomberg BNA he doesn’t believe that the recent spate of accidents this past summer will result in a hike in future suits. “Like we’ve seen in other industries, there are always a few bad apples that can give a negative reputation to an entire industry,” he said. “By and large, amusement parks are safe. You just don’t see breaking news highlighting the millions of Americans who had a great, accident-free time at Six Flags, or Disney World,” he said. Ahead: In Part 2, we examine whether more safety regulation is needed and whether states are adequately filling in gaps. In Parts 3 and 4, we look at theme park litigation.